Hi all! Many have wrote to me that they have tried the chicken recipe and they (and their baby of course!) Love it!! Nom! Nom! Nom! 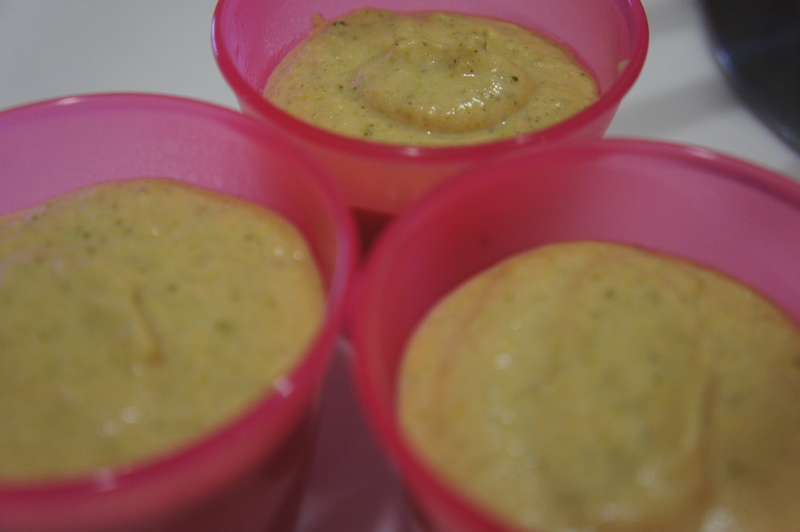 Now I would like to share another recipe from Annabel Karmel’s Baby & Toddler Recipes. 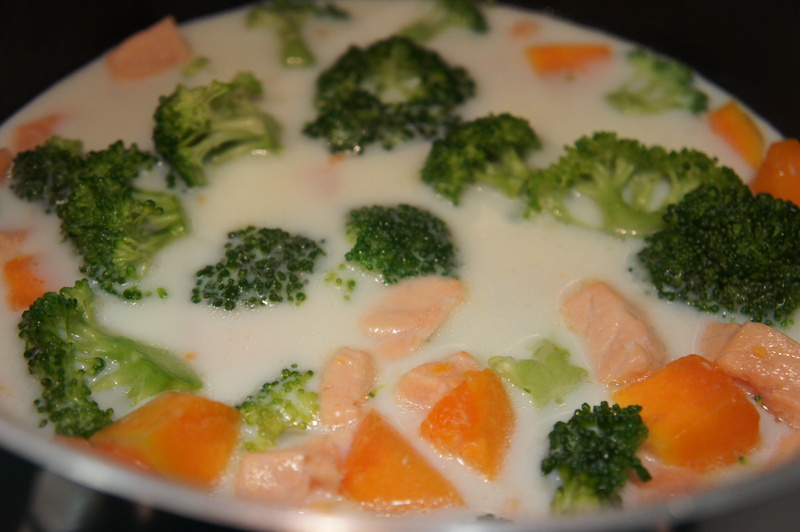 This time it’s fish meal… Salmon & Broccoli Puree!! First, you heat the olive oil in a pan. 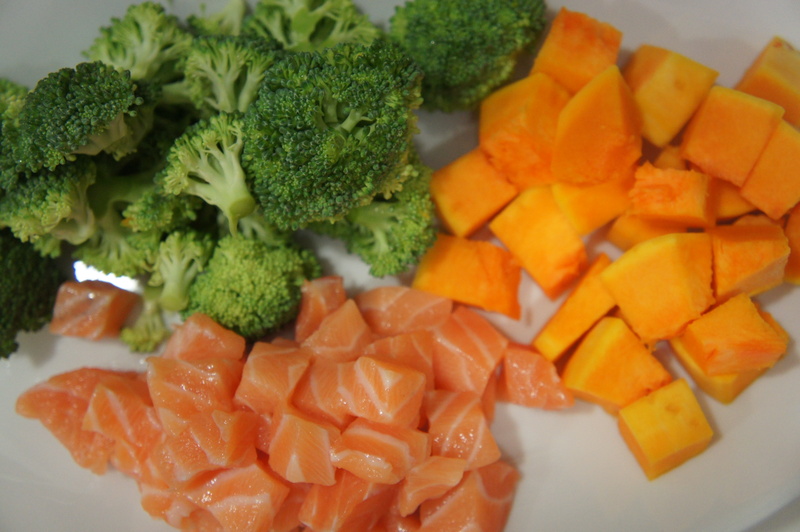 Add the butternut squash (or pumpkin), broccoli and salmon. Pour milk.. I used the usual full cream Dutch Lady milk in boxes.. about 150ml. Not too much.. Boil, cover and simmer. That will take about 10-15minutes until the vegetables are soft and salmon is cooked. How do you know your salmon is cooked? It is when it becomes flaky when you try to break it. Then.. finish! Walllaaaaa…. It has the goodness of omega 3 and 6 from the fish.. beta-carotine from the broccoli, vitamin A and E from the pumpkin and calcium from milk. I personally have never tried using my own milk.. so, please don’t ask me that question! Haha.. Transfer all the stuff into your food processor or blender or whatever you call it.. Add in some grated parmesan cheese.. I guess cheddar cheese pun buleh jugak kot.. asalkan cheese! And some lemon juice if you think your baby couldnt take the taste of the salmon.. and blend! Posted on March 26, 2012 December 2, 2012 by Dr Halina Mohd YunosPosted in MommyhoodTagged recipe, solids. Next Next post: B’s Busy Busy Day!! mommy baby pun terliur tengok..hahhahaa. Doc, puree tu mmg nmpk sedap..
i also want to try this recipe..
but just makan puree ni saje without kanji nasi? you dont need rice because rice is only carbohydrates.. and pumpkin / butternut squash is already contain carbohydrates..
Oh the colours so meriah. I like! Selain salmon, what other fish you pernah try? Cod, tenggiri, dory boleh? im gonna experiment on cod soon 😉 i wanna her to get use of the taste before changing to other fish / meat..
errr.. no. it’s just a small container for baby food. one container utk sekali makan.. that is about 4oz of food..
kenape doc tak gune ebm instead of DL milk? Btw, I was about to intro my son with cheese. Bila umur yg sesuai doc? dear u steam everything then u terus blend ke? do you add the fresh milk after that? im not sure about cheese but Bella is already taking cheese now. I mixed with this salmon meal 😀 ok jer i tgk..
Doc, is it okay if my baby fullu bf and i mix Ducth Lady full cream milk into her meal? Nanti dah tak fully bf la kot eh?? once you have started of food, mmg dah tak fully breastfeeding dah namanyer.. no worries abot that fatimah..
salmon! ❤ salmon! mcm ni mummy baby pun bole tumpang skali..
salam doc Halina.. nk tye. doc gne olive oil dr product y mne?? i use the organic one. you can find at the organic shop. forgot the name of it..
Reading your blog make me wanna get marry early dr.!! hahaha..
Hai doc. Is it okay to gv our baby minum that fresh / full cream milk now? My baby is now 9 th yrs old. Think I heard somewhere, that baby below 1 yrs old tak boleh drink that kind of milk, their perut still tak boleh nak take it? Is true doc? I read abt that too but there’s another school of thought says its ok. Tried on B.. Everything is good so far..
if follow our Prophet Muhammad (pbuh), fish with dairy product (Milk) cannot mix together cause one has positive and one has negative ion. The nutrient will be ZERO when consumed. Just a humble advise….send my regards to Dr SMS. Dr, how do u freeze d baby food? letak je dlm fridge or u gotta seal it with a plastic first? n when thaw d food, will d nutrients go away? Must cover of course.. As far as i know.. The nutrition remains..
dr halina, nk tny ..ape pendapat dr tentang baby led weaning..bella penah try tak? i downloaded the iphone apps..
doc, garam gula tak payah masuk dalam masakan untill age berapa? i thought baby below 1yrs old cant take fresh milk like the cows milk? kalu save dlm 3 small tperwre cmni..n then msukkn dlm peti ais yg slbihnya..time mkn kena pnaskan smula ke? or xpyh pnskan? Mesti lar panaskan.. Sian baby kena mkn mknn sejuk..
My opinion.. Klu takut nk bg cow milk pada baby.. Tumis semua bahan campur air sikit bagi empuk.. Blend and add on breast milk..
dr. yang ni tak boleh sejuk bekukan 2- 3 hari ke? docter , xsilap saya ikut pada pemakann rasulullah xelok ikan + susu. tolong perjelaskan..